Jasminum nudiflorum is a beautiful flowering shrub originating from northern parts of China but easily propagated in USD zones 6a to 9b. The shrub is commonly known as Winter Jasmine because of its attractive yellow flowers that bloom in winter when very few plants bloom so profusely. For this reason, it is considered a valuable shrub in colder regions. Jasminum nudiflorum produces arching branches with dark-green leaves and makes an excellent plant for growing against walls or arching over a trellis or pergolas. It is propagated from cuttings taken in summer and benefits from regular pruning. 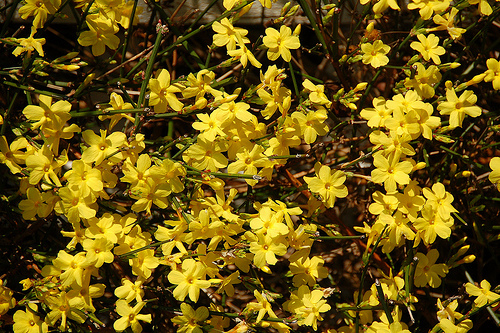 The best spot to grow Winter Jasmine in a garden is a partially sunny location in a well-drained soil.